With the potential crisis averted last weekend, Ireland head to Cardiff in a historically favourable position – angry and with a point to prove. In the immediate aftermath of Sunday’s game, it was hard to escape the feeling that Ireland had, probably subliminally, gone into the Italian job with one eye inescapably on France seven days later. Obviously we here it on rote these days that the players are professionals, that they don’t listen to outside noise and take each game as it comes. All the available empirical evidence would suggest otherwise. Did South Africa approach Japan as they would have the All Blacks? Certainly not. To a far lesser extent Ireland appear to have entered last Sunday’s game with their focus and intensity askew. And at this level as we’re repeatedly told, you only need to be one percent off your game to be exposed. From the off it seemed that the Italians were quite simply better prepared for a battle, ably facilitated by Ireland’s soft defensive line. Now, as far we understand, the intention here is to guide the attacking side laterally ultimately using the touchline as an extra defender. How in the world though does this justify giving the Italians twenty-five easy metres off a scrum, simply by shifting the ball wide? The line speed improved in the second half but dipped once more, particularly when Josh Furno’s try scoring opportunity was created. Ireland were listless at ruck time –not helped by the otherwise excellent Peter O’ Mahony’s yellow card for a rash, arm-free charge at the ruck- and quick ball was at a premium, save for when Iain Henderson carried. When the ball was there, receivers took it deep from a standing position and were invariably stopped behind the gain line. The early connect between Robbie Henshaw and Keith Earls was truly promising but after the game’s only try, numbers eleven to fifteen were rarely required to focus on much more than their kick chase skills. With David Kearney and Tommy Bowe ostensibly taking part in an audition for one wing spot, both must have been truly disappointed at the paucity of attacking opportunities that came their way. Similarly, the uncomfortable looking Simon Zebo. There is no pint in engaging the Corkman to mimic Rob Kearney, not when their skill sets are so vastly different. Watching Sunday’s game one couldn’t help but draw comparisons to the 2013 hammering by Australia which officially ushered in the Joe Schmidt era. That day the defensive line fell off while there was little or no direction in a completely anaemic attack. The following Sunday felt like a trip to the gallows with a peerless All Black side set to finish off their unbeaten year with a comfortable victory in Dublin. Of course, we all know how events unfolded. From minute one that day, the home side tore into their far more illustrious opponents, playing with heretofore unseen intensity levels for an Irish side, bringing the defensive line up quickly and carrying with support runners straight through the heart of the ruck. Simple rugby carried out with incredible accuracy and efficiency. And this is what Ireland must aim for again next Sunday in Cardiff. As insipid as last week’s performance was, Ireland still took four points from the encounter with no injuries reported. Irish teams invariably respond more favourably when they are cast in the role of underdog, or at the very least when they are not overwhelming favourites against a competent team. To be quite blunt about it, sometimes a kick in the arse beats a pat on the back. Joe Schmidt has already indicated that perhaps the most frustrating aspect of the performance was the concession of ten penalties –Peter O’ Mahony, though superb, was pretty much namechecked by his coach in this regard- and despite the widely held theory about holding back our hand, teams don’t intentionally display bad discipline as a ruse. This is the first area that needs to be rectified for Sunday. Beyond this, of course, we move to the great unknown, the magic tricks which Schmidt and his coaching team have been concocting since the squad first gathered during the summer. We’ve possibly beaten all our poker analogies to death at this stage so suffice to say, Cardiff will be the stage where Ireland’s backline makes its big reveal. Our half-backs, amongst the best pairing in the world, need to perform this week as we know they can. There was something disconcerting about watching Jamie Heaslip feed Conor Murray off an attacking scrum, whereupon Murray grubber kicked straight to touch. None of the other eight potential quarter-finalists would have attacked off first phase in this manner –to their credit Ireland did a job on the Italian lineout but it’s a pretty limited mode of attack- so again let’s presume that this is all part of a giant Kayser Soze-like deceit. Of course, what everybody wants to see more than anything is a backline with the potential to unlock their opponent’s defence, by trickery or otherwise. Under Philippe Saint-Andre, France may have lost their attacking verve but they have developed an extremely aggressive in your face defensive wall that simply will not be unlocked by a series of predictable wraparounds. However, in Joe Schmidt’s tenure Ireland have become extremely clinical, so just a handful of line breaks will be sufficient to set up decent attacking platforms. We suspect that February’s game against the French in Dublin provided a pretty accurate blueprint of what we’ll see in Cardiff: direct carries in midfield, trench warfare on the ground and aerial bombardment. Up to this point, possibly due to our shamefully presumptive nature, we have focused solely on Ireland –Sergio Parisse aside- prior to each group match. This time, however, it would be remiss of us to ignore the challenges that France will bring. On current form, the French have by far and away the most effective ball-carrier in either pack, in Louis Picamoles. The number eight simply cannot be allowed boss the collisions as Parisse was, and if gets into open field he can be as destructive as any of the French backs. The Toulouse is assisted by the no-frills Bernard le Roux* and their redoubtable captain, Thierry Dusautoir. Without a shadow of a doubt, this unit will provide Ireland with their greatest challenge since Wales in Cardiff last March. Sean O’ Brien is Ireland’s obvious wrecking ball yet it is the perceived dirt merchant in the back row, Peter O’ Mahony, who has actually been our most effective carrier within the unit. Once more the question arises as to whether we are picking the right back row combination? It seems highly implausible that either O’ Brien or Jamie Heaslip will be dropped -though Sunday requires a marked improvement in performance from both- so if a change is to take place it would be likely be the heretofore highly impressive –both in open play and in a highly functioning lineout- O’ Mahony dropping out. 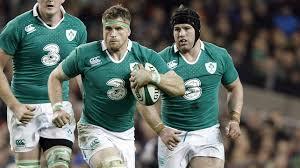 And yet…..
Ireland need big performances from Jamie Heaslip (centre) and Sean O’ Brien (right) on Sunday evening. O’ Brien has grown into the role of poacher but one wonders if this has nullified his carrying threat? Where are the barnstorming runs last seen as recently as March in Murrayfield? Would a move to number eight at Heaslip’s expense or six at O’ Mahony’s with Chris Henry – Ireland’s best ground operator in the contested areas- coming in at open-side in each case be logical moves? These are options that we have touched on before and even if we don’t believe that immediate change is necessary, there is merit in considering these alternatives. If O’ Mahony, Heaslip and O’ Brien can fulfil their respective roles of disruption, control and destruction then Ireland will assuredly have the upper hand. If, though, as the game unfurls the French are preventing a flow of quick ball in Conor Murray’s direction then Henry must be introduced. Our best back row is still the unit that started last Sunday but the situation remains fluid. One recurring, slimmed down though still sizable, problem that Ireland must face is the potential match-winner Mathieu Bastareaud. The Toulon centre has always caused trouble for Ireland, whether with the now retired Gordon D’Arcy and Brian O’ Driscoll or one of Bastareaud’s current targets, Johnny Sexton. That last statement is probably a little disingenuous as the destructive Bastareaud’s remit is to damage the body and weaken the mind of all out halves, not just Sexton. If he gains momentum and crosses the gain line , Bastareaud has the Ma’a Nonu like ability to free his hands and facilitate the French second wave. 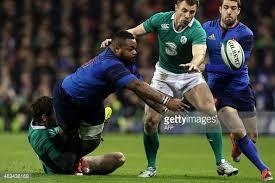 Ireland need to nullify the line-breaking ,off-loading threat of Mathieu Bastareaud. The rule for Bastareaud –not dissimilar to the one employed so successfully by Wales four years ago to foil O’ Brien and Stephen Ferris- will be to hit him as early as possible, ideally behind the gain line. The position in which the big midfielder gets the ball is intrinsically linked to the quality of the ball laid at the feet of Morgan Parra. Slow ball allows the Irish line to shoot up quickly, hopefully foregoing the passive approach seen at the Olympic Stadium. Also, as Gordon D’Arcy pointed out this week, Robbie Henshaw is a pretty big unit, well capable of halting Bastareaud on and not over the gain-line. Nonetheless, the best one can hope for with Bastareaud is containment as he is quite simply too big to overpower or dominate. Which leads us to maligned, then popular, then oddly maligned once more and now seemingly due to his absence, popular again, Jared Payne. Who knew kicking the ball three times in a tournament could get you on the wrong side of that old sage, Matt Williams? Payne will bring renewed stability to the Irish midfield while guaranteeing crucially important go-forward ball and largely underappreciated distribution skills. Payne and Henshaw had developed a decent understanding by the end of the Six Nations but further growth has been stymied by the unavoidable intervention of injury. Now, as a friend pointed out to us recently, the World Cup is not being played exclusively by centres but the outcome of this game within a game on Sunday will prove absolutely crucial. The biggest questions will be asked of Ireland when the benches empty around the hour mark. Cast your mind back eight months and you will recall the breathless finale as Ireland desperately repelled wave after wave of French attacks, the latter supplanted by twenty stone monsters off the bench. We have a feeling that this is precisely how Sunday’s encounter will finish, a frantic endgame with the sides camped in the Irish twenty-two. Sunday is not do-or-die. To say otherwise would be plainly hyperbolic as both sides will get at least one more bite of the cherry. What it is though, particularly for Ireland, is an opportunity to enhance their credentials as genuine World Cup contenders. Interestingly no side has ever won the tournament after suffering a group defeat and it would be preferable if Ireland didn’t have to buck this trend. Ireland arrive in Cardiff more or less exactly as we expected, predicated of course on the fact that we have thus far only had a glimpse at the full armoury. France, wired as they are –uniquely- simply know how to step it up in World Cups. That statement would sound lazy if it wasn’t so patently incontrovertible. It will come down to fine margins and we’re inclined to back a hopefully even angrier than usual Johnny Sexton over the admittedly resurgent, though still flaky, Freddie Michalak. Two roads diverge in Cardiff on Sunday. It would be preferable if the one through New Zealand was the road not taken. Ireland by a whisker. *Damien Chouly has been selected at blindside flanker ahead of Bernard le Roux.